We are a year-round, professional tour company and we provide a comprehensive spectrum catering to all travel and tour segments including FIT, GIT, leisure, pre/post conference tours, incentives tours, adventure tours, nature tours and recreational outdoor activities. 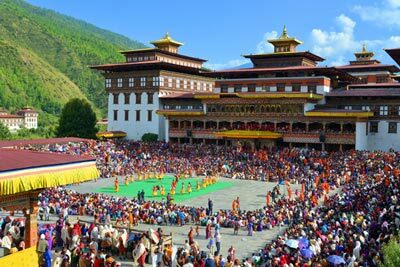 Our tours cover domestic’s tour within Bhutan as well as outbound tour to Tibet, Nepal and India. All our packages are well planned and coupled with some special interest itineraries that are tailored to suit the varied lifestyle of our clients and meet their requirements fully. We are supported by a crew of committed, dynamic and responsible team. They are well trained with relevant experience between two to fifteen years so as to live up to our reputation of providing efficient services. 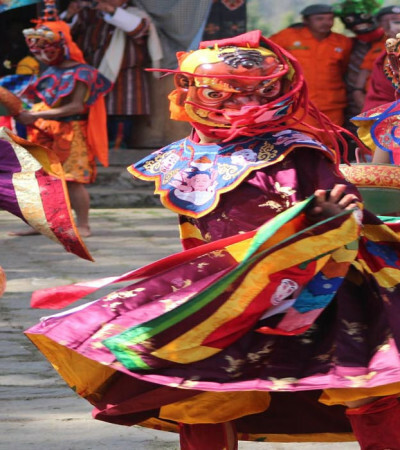 This is a special and unique tour is designed for nature lover and explorer with a longer holiday program in mind and a desire to discover the Bhutan to its best. After a beautiful experience over the highest Himalayas on earth, you will reach Paro airport. Yatara Adventure representative (guide & driver) will meet you at Paro airport exit doors following customs formalities. Ta Dzong Museum was built in 1649, by Paro poenlop Tenzin Drugdra (governor). 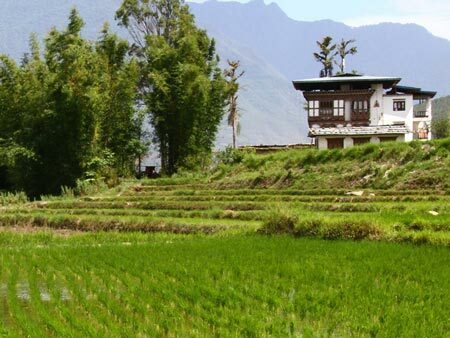 Housing many religious relics, works of art and handicrafts offering a great orientation into Bhutan’s historical, cultural, and religious past. Next you will visit the auspicious Kyichu Lhakhang (temple), a sacred monument pinning down the left foot of a treacherous ogress, which is built in 659 A.D by the Tibetan king Songtsen Gampo. 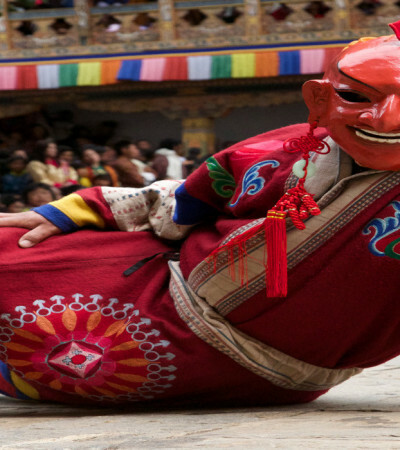 This Monastery is one of the 108 monasteries built across the Himalayan region by the Tibetan King to subdue the Demoness that lay across the Himalayan region. This Monastery is one of the 108 monasteries built across the Himalayan region by the Tibetan King to subdue the Demoness that lay across the Himalayan region. 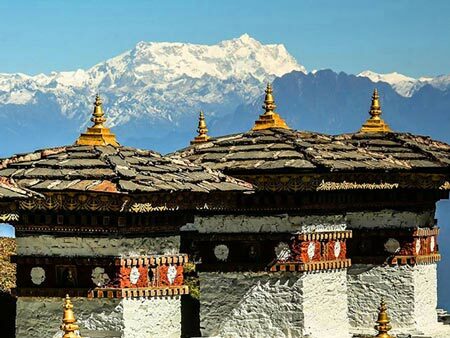 The rest of the monasteries lie in other neighboring countries; Drukgyal Dzong the imposing fortress which was the strategic vantage point for numerous defeat of invading Tibetan armies and here in clear weather can view the spectacular view of mount Jomolhari 7314m. Evening freely stroll in town and visit shops. Distance: 4 hours approximately for each. After breakfast check out of your hotel and drive for about three hours to Wangdue and Punkaha valleys. Enroute stop over at the Dochulaa Pass (3150 meters) and enjoy the spectacular views of the snow capped Himalayan Mountains. The 108 small stupas built over a small hill is also a beautiful sight. The road from the Pass winds down to the warm and fertile valleys and after a brief rest visit the Fertility Temple / Chime Lhakhang. 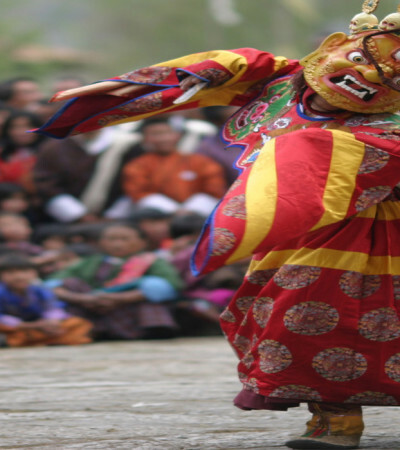 Continue and enjoy your drive through sleepy villages and settlements till you reach Trongsa. Today you will drive to Zhemgang locally known as Kheng and is one of the most remote and least developed districts of Bhutan. You will hardly meet any vehicles and will surely enjoy the peaceful drive. The main town of Zhemgang consists of few houses and you can enjoy a stroll through the small market and visit the traditional style house and shops. Overnight: Eco Lodge at Dangkhar village in Zhemgang. You will spend the day visiting the three main villages of Dangkhar, Trong and Dakpai located in and around the main town. The Trong village consisting of traditional centuries old houses is being preserved as a heritage village and the small village still has intact old structures and pathways. You can visit some of the houses, interact with the villagers and visit their farmlands and vegetable gardens. After breakfast drive towards the satellite town of Tingtibi where the weather is much warmer. After a stroll through the small settlement continue drive till you reach Gomphu village. From there walk downhill for about 2 hours till you cross the Mangdue Chhu / River and reach Dunmang Hot Springs. There are many ponds of varying degrees of water temperature and you can spend the rest of the evening at the hot spring. Today you will spend the whole day enjoying the various hot spring pools with different medicinal and healing properties. Hike back to the road point at Gomphu from where your vehicle will take you through Rendaybee village till you reach Pangtang. The road is newly constructed and you will enjoy this safari like drive through the serene and beautiful nature. Overnight: Eco lodge in Pantang. 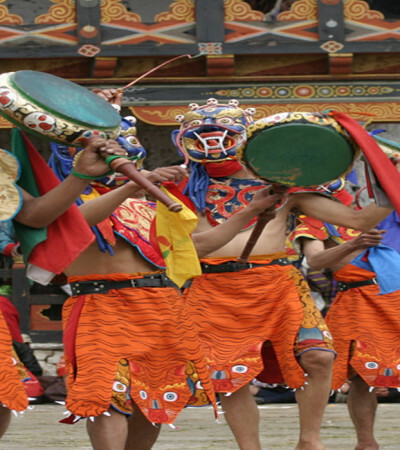 Enjoy the full day excursion of the rural villages of Pangtang, Bhudashi and Goshing. Walk to the three villages and visit their community schools and Basic Health Units. Visit some traditional houses and their farmlands, interact with the villagers and with your guide as your translator you can listen to their stories and legends of the places. Drive through the same newly constructed road through the villages and enroute visit the rural villages of Shilintoe and Repati villages. Mana is also extremely rich in wildlife species, including the highly endangered Royal Bengal tiger, Asian elephant, greater one-horned rhinoceros, clouded leopard, Himalayan black bear, gangetic dolphin and pangolin. Found virtually nowhere else in the world is the especially rare golden langur, a primate of extraordinary grace and beauty with its long, silky blond fur. After an early breakfast you can either hike for about 6 hours to reach Bjoka village, enjoying the landscape and walk OR you can drive through the farm road to Bjoka and spend the day exploring Bjoka village. Bjoka is one of the most remote and lease developed of all the places in Zhemgang. The unique feature of Bjoka is the production of handmade cane and bamboo products which is the main source of livelihood of the people. Items like the bangchungs (round tiffin-like plates) andsmall storage containers are made and sold off to the other parts of Bhutan. In the past when there were no roads (till 2014) people had to walk for 4 – 5 days to reach Bjoka from the main town of Zhemgang. From here on you will drive back to Gomphu and stay the night at the Eco lodge in Gomphu. After early break fast drive towards Trongsa (150km/6 hrs.) Trongsa is the ancestral home of Bhutan’s ruling dynasty. After lunch visit Trongsa Dzong, the largest Dzong in Bhutan and the Ta Dzong museum housing a collection of historical artifacts of the Royal Family. After breakfast proceed towards Bumthang (2.5 hrs. 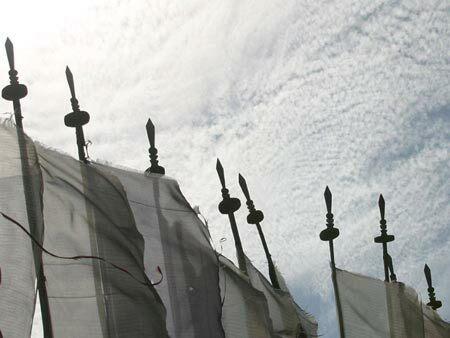 ), the spiritual heart of the kingdom. 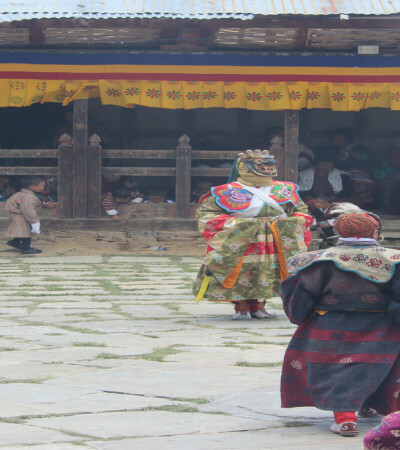 Bumthang is home to some of Bhutan’s oldest Palaces, Buddhist temples and monasteries. On arrival, visit Jakar Dzong (Dzong of the White Bird) and 16th century Tamshing Lhakhang containing ancient Buddhist wall paintings. After lunch visit Kurje Lhakhang, one of the most sacred places in the kingdom and 7th Century Jambay Lhakhang. Enjoy a day exploring some of the many sites around Bumthang, including the 16th century Tang Ugyen Chholing Palace museum containing an overview of traditional rural life in Bhutan and the pool of Mebartso (The Lake of Fire) where Pema Lingpa (founder of the Nyingmapa sect) is said to have found treasure hidden by Guru Rinpoche. 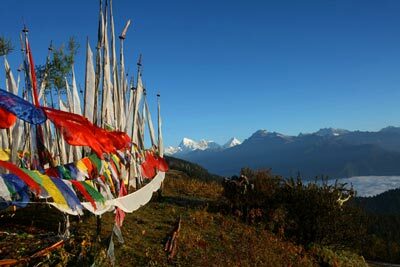 The journey to Mongar takes about 6 hours with spectacular views en route. Drive through Ura village before climbing sharply to the highest point on Bhutan’s road network, Thrumsing-La Pass (4,000m). From here, the road gradually passes through picturesque alpine valleys, pine forests, maize fields and hamlets to reach Mongar town. Visit Mongar Dzong, built in the 1930’s using the traditional process without either plans or the use of nails. Drive to Trashigang (3 hrs.) through leafy forests filled with ferns and over Kori-La Pass (2,450m) before descending through cornfields and banana groves to reach the famous road zigzag just below Yadi. 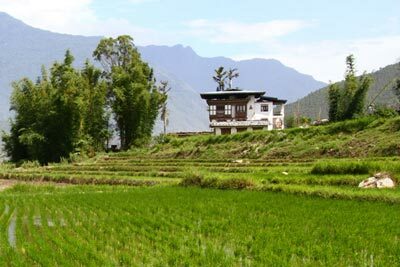 Trashigang is the main township of the largest district in the country. After lunch visit Trashigang Dzong. Visit the temple of Gom Kora and Doksum Village where you can see women busily weaving traditional Bhutanese fabric before reaching Tashiyangtse, the administrative Centre for this district. The area is famous for its unique wooden crafts. Visit the Tashiyangtse Dzong, and the dazzling white stupa of Chorten Kora and the nearby institute for Zorig Chusum, where student are trained in Bhutan’s 13 traditional arts and crafts. After breakfast drive to Samdrup Jongkhar, the gateway to eastern Bhutan and to Assam, India. 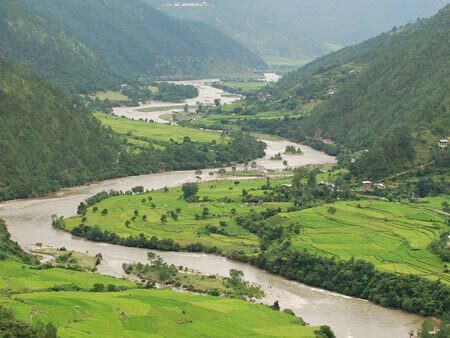 It is about 9 hours drive from Trashigang with many beautiful villages and landscapes on the way. After breakfast, your guide will arrange an Indian vehicle your transfer to Guwahati, the capital town of the Indian northeastern state of Assam, for your onward flight. •	Explore Royal Manas Park - rich in wildlife species, including the highly endangered Royal Bengal tiger, Asian elephant, greater one-horned rhinoceros, clouded leopard, Himalayan black bear, genetic dolphin and pangolin. 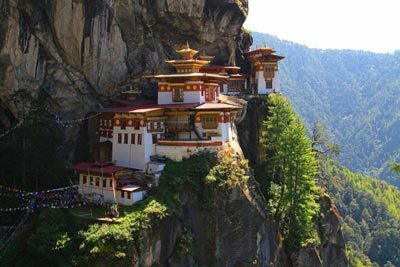 •	Tiger’s Nest/Taktsang Monastery. Hanging onto a precarious almost vertical mountain cliff, it’s a spectacular sight in terms of location, setting and history and is one of the holiest sites.